SAN FRANCISCO – A sense of urgency pervades this year’s meeting of the Association of American Colleges and Universities. The tenets of a broad, liberal education have been under assault at the state and national level, many Americans have grown skeptical of the cost – and debt – that college brings, and the terms “evidence” and “value” seem mandatory in any conversation about higher education. The sessions at the AAC&U’s annual meeting this week have been filled with discussions about telling the story of liberal education, effecting change across departments and campuses, scaling effective practices to improve learning and retention, and creating an inclusive, equitable and global-facing educational environment amid a political climate of anxiety, suspicion and nativism. No one at this year’s gathering has all the answers we are all seeking. And yet, even among the concern and urgency over the future of higher education, there is clearly a sense of hope. After all, those of us at the convention believe in the mission of liberal education and see ourselves as problem-solvers. No one is cowering or retreating. 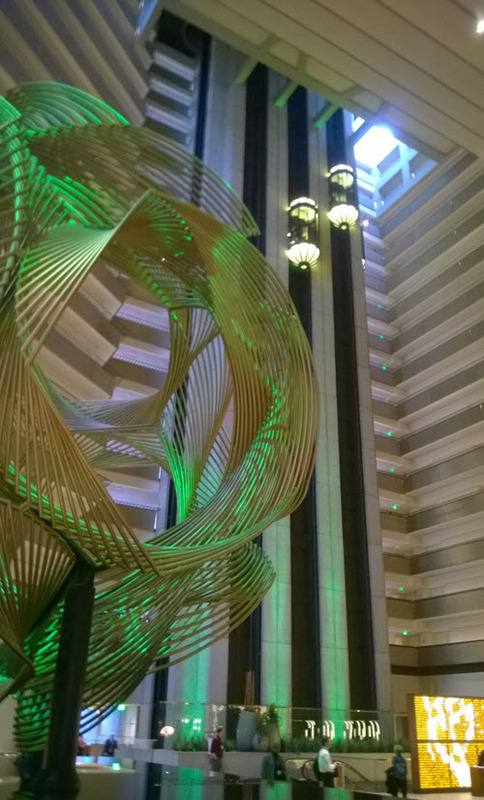 The atrium of the Hyatt Regency in San Francisco provided an expansive visual setting for the AAC&U conference. Like higher education, it mixed the abstract with the practical, the expansive with the creative. A big question, though: Are the elevators of higher education going up or down? An early panel discussion did an excellent job of framing the problem that colleges and universities face – one that they helped create – but also of illuminating potential pathways forward. That panel, titled “Always on the Fringe,” emphasized the shift over the last two decades away from college as a public good. Goldrick-Rab said that as colleges shifted their focus to education as a commodity, the financial system shifted from grants to loans to pay for college. That has led to a “high tuition, high aid model,” she said, convincing colleges that they could charge increasing amounts because degrees have value, while offering scholarships and other financial aid to discount the price. That approach, she said, hasn’t worked, largely because it fails to take into account the rising cost of housing, books and other learning materials. Students are being priced out, and middle-class students are struggling with the cost of housing and food. Thirteen percent of community college students are homeless, she said. Beverly Daniel Tatum, former president of Spelman College, said Spelman had avoided that “high cost, high aid” model but that the financial pain families endure is very real, especially when students fail to graduate. Michael Roth, president of Wesleyan University, spoke about the challenge of regaining the public’s trust. If universities depend solely on the private sector, he said, they will be told to produce more welders and fewer anthropologists. “So how do we lobby for more funding without sacrificing our autonomy?” he asked. Selingo said higher education needed to stop clinging to the past and start thinking about what the college model, mission and experience in the 21st century should be. “We keep going back to the model of public education from the 1960s rather than looking forward,” he said. One way to start that process, he said, is to rethink how we talk about higher education. Our emphasis on the broad components of liberal education doesn’t register with most people, he said. People want opportunities and jobs but don’t know how to get there, and colleges and universities need to learn how to speak in those terms. Policymakers in Washington haven’t been much help, he said. They tend to come from elite institutions that continue to grow more elite. “They have never met the students who have struggled,” Selingo said, but they set policy for everyone. All the panelists spoke of a need to help students connect classroom learning to careers. That is, we need to better explain how the skills students gain in philosophy, chemistry and other disciplines translate into skills they can use on the job. That is especially important, they said, because the number of freelance and temporary jobs has been growing faster than traditional jobs. Many students may never work as a traditional employee, they said, and must learn how to thrive in that freelance world. Roth said, somewhat facetiously, that “critical thinking is vastly overrated.” For most students, criticism comes easily, he said. They find it much harder to build on ideas, develop opportunities and work creatively – all things that we need to improve in our classes. “If everyone is critical, ideas die quickly,” he said. True critical thinking is as important as ever, though, Tatum said, given the political turmoil and our tendency to surround ourselves with people who look and think like us, even as the world grows more diverse. Those are components of what she called the “stuckness” of society. Among the solutions that came up in that panel discussion and at other sessions this week reflect the determination among educators. Build on skills students already have. Too often, we focus on what students are lacking rather than on what they bring to the classroom. Broaden the conversation. We usually think of education in terms of teaching, but everyone a student comes into contact with can have an impact. In fact, one workshop leader said, food service workers and maintenance staff often know students better than faculty and administrators do. We need to bring those members of the university community into our conversations. Improve listening skills. This goes for students, faculty and administrators. We need to help students listen to one another but also need to improve our own ability to listen to opposing views and understand the underlying thinking. We all need to break out of our parochialism, Roth said. Throughout the conference, there was agreement that higher education needed to do a better job of explaining what it does, why it matters and why it deserves public support. And we need to do that quickly. Tagged change, future of higher education, remaking higher education. Nice summary of the panel, Doug. It captures both the challenge and the positive commitment to continued improvement. The hardest change may be getting excellence in teaching out of the back of the bus. Provost Vitter made improvement a big item in the campus conversation, and he put funding into programs that had evidence of improvement in learning and completion. But the people doing the heavy lifting in that work may run into their own barriers when it comes time for promotion to the highest ranks and being recognized in the minimal salary increases KU gives. What’s nice about your report is that people need to understand the urgency on this topic felt around the country, and most especially among the leading policy makers and institutional shakers. I like the metaphor of moving excellent teaching out of the back of the bus. You are absolutely right. Higher education must adopt a more balanced approach of teaching and research if it hopes to survive. There’s a lot of movement in that direction, as the AAC&U conference demonstrated.